Pues la verdad es que pinta muy interesante, el primaris, si la vista no me falla, parece que es de 3 cargas de disformidad, eso si, invocamos a 12UM 10 desangradores, horrores, portadores o diablillas; o 5 mastines, 3 incineradores, 3 enjambres o 5 buscadores, lo que prefiramos. ¿Cagar lineas con invulnerable todos los turnos? Si gracias. El resto de poderes tenemos un poco de todo, una bendición de +1 a la invulnerable de demonios cercanos, un lanzallamas con torrente, un rayo antiblindaje y antipersona, y otros tres hechizos de invocación, cada cual mas potente, pudiendo realizar con uno de ellos una posesión demoniaca a la antigua usanza para sacar un Gran Demonio. Ahora solo falta ver quienes podrán acceder a esta disciplina. 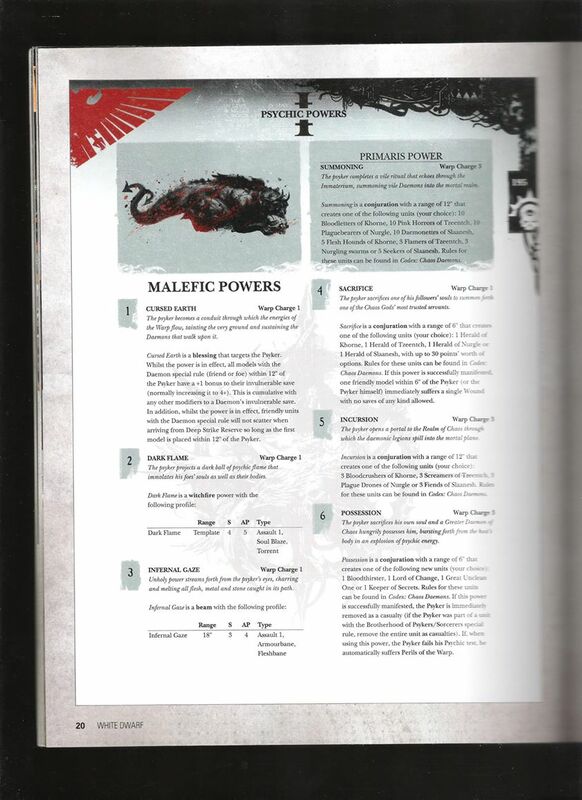 Sounds pretty interesting, the primaris power seems something like for 3 warp charges we can make a summoning at 12″ of 10 Bloodletters, Horrors, Plaguebearers or Daemonettes; OR 5 Hounds, 3 Flamers, 3 Swarms or 5 Seekers, whatever we want. Troops with 5++ every turn? Yes please. The rest of powers are a little bit of everything, a blessing of +1 to near Daemon’s invulnerable save, a Torrent flamer, an armourbane and flashbane beam, and another three summoning spells, being one of them the “Old School” Daemonic Possession for one Greater Daemon. Now the only detail left is which armies will have access to this discipline. This entry was posted on Monday, May 12th, 2014 at 11:54 pm	and tagged with Chaos Daemons, Demonios del Caos, News, Novedades, Rumores, Rumours, Warhammer 40k and posted in News, Novedades, Rumores, Rumours. You can follow any responses to this entry through the RSS 2.0 feed.